I have finally started working through those mixed media middle grade novels I got from BEA. While these books are not typically my favorites, the kids at the library go gaga for them…so I have to familiarize myself with them. So, I got this as an ARC from the publisher in exchange for an honest review. Mac gets a call from the demanding Queen of England, whose crown jewels have been stole. 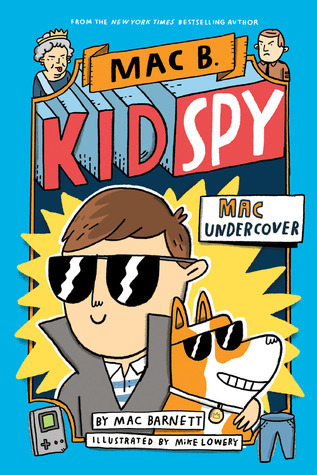 Mac is the only one who can solve the mystery and return the valuables. She flies him to England and he starts uncovering the secrets with the help of the Queen’s corgis. The French Prime Minister is super suspicious and it will take only the best spy to figure out how he fits into the plot. This book is super weird, yet super funny. I can think of many guy readers who would be rolling on the floor laughing at this book. It has the potential to become popular with the kids who have read all of the Captain Underpants books. I just purchased this for a fan of the captain underpants series!